I've managed to stay off the latest BBC outrage all week, telling myself it's off-topic. But I'm afraid Humphrys lecturing quangocrat Lyons this morning on how the BBC should get back to being "a civilising influence" in the life of the nation, has made me crack. What shocked us about the original Ross/Brand "misjudgement" was the happy-slapping bullying of a nice old man by two public employees who had grown far too big for their boots. Instead of acting like the servants they're supposed to be, they had come to believe they were the masters. And bad masters at that. But listening to Humphrys this morning - and indeed the legions of current and ex-BBC employees lambasting us about how the fuss is entirely down to the evil Daily Mail - underlines the simple fact that they all consider themselves our masters. Relieved of any need to compete for our pounds, they dish out what they damned well please. From happy-slapping to "civilising" sermons, tax-funding means the BBC can bully us as much as it wants. The good news is that many many more of us are now calling time on the whole monstrosity. On BOM we have long called for full privatisation, but even those who don't want to go that far are now asking why we should pay £3.5bn pa in tax to support one of the biggest media companies in the world (see here for some Grade A BBC bashing)? Why should taxpayers be forced to fund output that could easily be funded on a commercial basis? At the very least, why not shrink the BBC back to its origins - ie one public service TV channel and one radio station? But of course, the whole state sponsored tax-funded bullying issue goes far beyond the BBC. The entire public sector is founded on the belief that we little people cannot be trusted to manage our own lives. We must be whipped into shape by an omniscient benign nanny. It isn't bullying: it is civilising. And we should be duly thankful. PS The parallels between the out-of-touch top management of the failing BBC and the out-of-touch top management of our failing banks hardly need to be spelled out. Neither have demonstrated an ability to control high risk operations, or to manage high-rolling "star performers". Moreover, both the banks and the BBC have got into trouble by moving way outside their traditional areas of business and expertise. Sticking to the knitting was deemed far too limiting, and both hankered after new edgy markets. And in both cases, it turns out, taxpayers have to pick up the tab. Of course, he's attacking Labour's usual straw man - nobody is actually suggesting taking money out of the economy now. The real issue - the one he didn't address - is how a reckless government like his is proposing to establish at least some modicum of fiscal discipline over the medium term. On that he was silent. It was a case of "trust me". 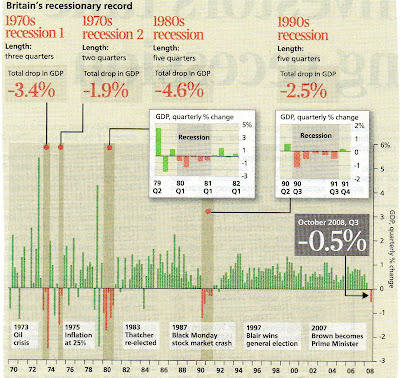 The IFS chart above shows the record of previous governments since WW2. Last year Labour borrowed £35.8bn, or 2.5% of GDP, so you might argue they were still broadly in the range. But the question is how much are they now going to borrow? As we know, they themselves haven't the faintest idea. They are being blown by the wind, all pretence at fiscal discipline out the window. But thanks to BOM's super-computing fag packet, we can exclusively reveal the ghastly truth - these clowns are going to borrow more than any previous peacetime government has ever done. Based on HM Treasury's most recent borrowing forecast - the one they published in March - and using HMT's own ready-reckoner (see this blog for details), we've crunched the horrible numbers. The key unknown is how much GDP is going to shrink. Nobody knows, but we do know we're in A Real Hole, so a reasonable sighting shot might be the worst recession we've had since WW2 - the one we had in the early 80s. Then, GDP fell by 4.6%. So we've assumed that GDP falls by a total of 4.6% by the next Election (ie April 2010). 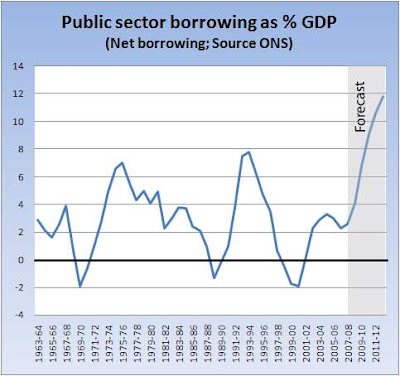 Just pause to take that in: on the government's current spending and tax plans, borrowing is set to soar far above the previous post-WW2 record - the 7.8% reached in 1993-94 under those hopelessboomnbustTories. A new record will be set in 2010-11, and by 2012-13, public borrowing will be running at a banana republic style 11-12% of GDP. And also understand this: our projection is a "best case". It takes no account of all the billions being poured into the banks. It takes no account of the forthcoming Keynesian spending splurge. And it takes no account of the very real risk that bond investors will rack up our borrowing costs (see this blog). Taking account of any of those increases the borrowing estimates by further tens of billions. Yup. That's right. It's back to the 1970s - tax rises and spending cuts. Big ones. The staggering economic ineptitude of Labour has screwed us once again. I really do wish you people would learn from experience and stop electing them. A question we've heard a few times over recent days is where is the government going to borrow all this money? Who's actually going to lend it to them? But the real question we should be asking is how much will the lenders demand for making the loans? In broad terms, the money will come from bond investors: pension funds, insurance companies, newly risk-averse banks, sovereign wealth funds, overseas central banks, and - whisper it - international speculators. Right now, they'll lend money to our government for, say, 10 years at an annual interest rate of 4.4%. Which is pretty decent of them, because with our 5% inflation rate, the real value of their investment is being eroded faster than the annual interest they'll receive. In other words, the real interest rate we're paying them is negative. So why would any lender accept that? Well, there are a number of reasons, including the fact that right now, many of the alternative homes for their cash look even dodgier. But the big reason must be that investors think the present 5% inflation rate is temporary. They must figure it will soon come back down to the 2% target - maybe even lower - leaving investors with a respectable 2-3% pa real return over the ten years. But what if they're overseas investors? Whatever they might think of the UK inflation outlook, surely they'd be put off by our collapsing currency? To which the answer is yes, they would. And we might note that the 4.4% rate at which the UK government can borrow in sterling is higher than the 3.8% paid by the US government in dollars or the 3.8% paid by the German and French governments borrowing in Euros. Still, a differential of 0.6% pa is a pretty small risk premium for a currency that has recently been falling through the floor. Which suggests that international bond investors have been persuaded that sterling's weakness will not continue. The underlying point here is that the interest rate bond investors demand depends heavily on their confidence over the outlook for inflation and the value of sterling. It also depends critically on just how much borrowing the government needs to do. As the chart above shows, through the easy years, that confidence held up pretty well. 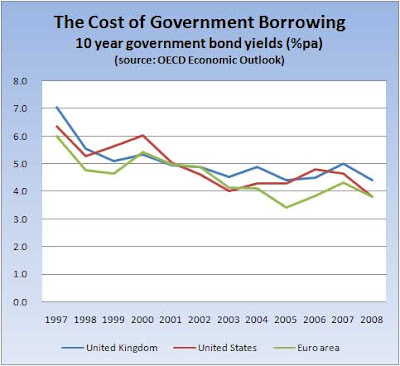 Despite their reckless public spending, the Labour government has been able to borrow at more or less the same rate as governments in the US and Europe. Specifically, they have only had to pay an average 0.2% pa more than the US government, and an average 0.5% pa more than the major European governments. Unfortunately, that is set to change. 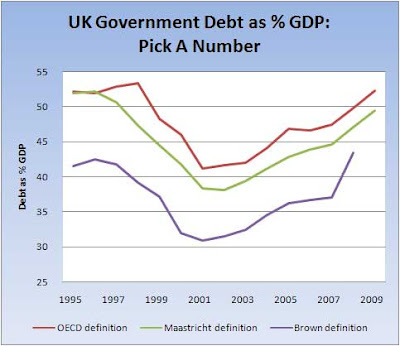 The abandonment of Brown's fiscal rules and a deep recession mean much higher UK government borrowing. Lower interest rates combined with our chronic current account deficit is certain to send sterling spinning again at some stage. Weaker sterling will almost certainly feed back into UK inflation. A vicious 70s style circle could so easily recur. What then of bond investors' confidence? 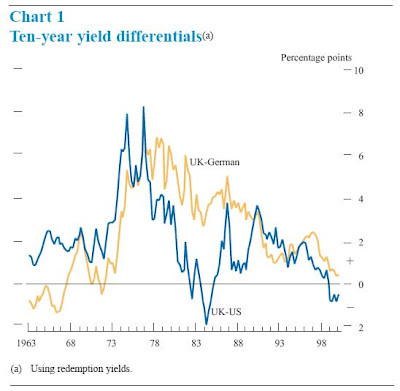 As we can see, for much of the period the yield (interest rate) on UK government bonds was 4-6% higher than that faced by the US and German governments. That's a huge difference. It means that on £100bn of borrowing - now easily in prospect for next year - the debt interest would be perhaps £5bn pa higher than under recent rates. And that cost would be compounded as old cheaper debt matured and came up for refunding at the new rates: over the next three fiscal years that will total nearly £100bn. After two or three years, a return to a 70's style loading on UK government borrowing costs could easily increase public spending by £15-20bn pa - say, 5p on the standard rate of income tax. So will those 70s borrowing costs return? It all depends on the bond investors and their confidence. How confident will they feel in a government that delivered reckless fiscal management in the easy years, and is now wanting to borrow more money than any UK government in peacetime has ever done. I confess to having a very bad feeling about this. As you will have guessed by now, this time the bonkers hippies really have taken over the asylum. Despite the fact we're facing the worst recession since the Black Death, the commissars have increased - yes, increased - the sacrifice we must make to the Global Warming God. By 2050 we are now supposed to cut our carbon emissions by 80% from their 1990 level. The cost will be catastrophic. Because - absent some miraculous and wholly unknowable technological breaktrough - the only way of hitting the target is to slash our GDP. The TPA has now krunched the numbers. According to their calculations, even if we sustain the same progress in cutting emissions per unit of GDP as we have since 1990 (which is highly unlikely, given that reflected the one-off "dash for Putin's gas" in our power stations), by 2050 our GDP will still have to be 78% lower than otherwise to meet the new 80% target. Tyler's back of envelope says that means a total sacrifice between now and 2050 of about £57 trillion. Yes, trillion. That's £57,000,000,000,000. Or £2.2 million for every single British household. Don't know about you, but I reckon I'll ask for my share now. In cash. I'll take my chances on sunnier summers. The government's line is that entirely out of the blue we've been hit by a tsunami from across the Atlantic. It's an act of God (the American Mammon), and the "responsible" thing now is to throw up a mountain of public borrowing in the hope we can clamber above the waterline. But despite the glowing international press Gordo initially got from "his" bank rescue plan, it's now becoming clear to everyone that Britain had become especially vulnerable to a tsunami. And the man primarily responsible for that is none other than Gordo himself. Let's look more closely at that regulatory issue, using some very helpful charts from the Bank of England's Financial Stability Report published today. 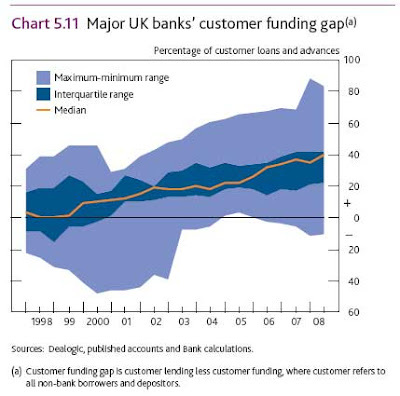 The Bank of Engalnd report contains a stack of other jaw-dropping material, but the point is made: it was on Gordon Brown's watch that our High Street banks went from being boringly tsunami-proof to being little more than baseless fabric, just waiting for a good puff of wind. His half-baked regulatory system totally failed to manage the mounting risks, even though it was clear our banks were exposing themselves to positions far beyond anything they were used to. He was reckless not just with our public finances, but also our personal savings and the very bedrock of our financial system. PS Has Tyler, under the pressure of events, turned into Will Hutton? He doesn't think so. Even free market zealots understand that banks must be regulated. Their core function is to take our cash on a promise of complete security and liquidity, and lend it out to borrowers who can offer neither. There's always going to be risk in that, which ultimately must be guaranteed by taxpayers (the consequences of not doing so having been demonstrated so vividly in 30s America). But in exchange for that guarantee, taxpayers have the absolute right to insist on regulatory safeguards, so as to ensure greedy bankers don't take the piss. Brown has singularly failed to enforce our right over the last decade, and we are now paying a huge price. 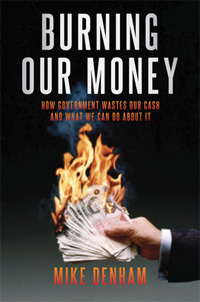 Amid all the financial disasters it's easy to forget the government's existing public spending disasters. But make no mistake - they're still there. This morning brings news that the £12-20bn NHS Supercomputer - the National Programme for IT - has ground to a halt. She said there were “undeniable” problems, but “to say everyone is walking away from it is a bit premature, probably”. We've blogged this fiasco many many times (see here), so its collapse comes as no real surprise. But it is a chilling reminder of how blundering government overstretch can cost us billions. And this was conceived before the new age of Keynesianism. "The Government cannot know how to use an expansion in expenditure that would not risk seriously misallocating resources. Furthermore, public expenditure has already risen very rapidly in recent years, and a further large rise would take the role of the state in many parts of the economy to such a dominant position that it would stunt the private sector's recovery once recession is past." Instead, they argue for looser monetary policy and tax cuts. Unsurprisingly, we agree 100%. For taxpayers, one of the most worrisome aspects of the credit crisis is that governments will spend further shedloads of our money on a series of half-baked public works programmes. They will talk about investing in infrastructure to lift our national productivity, but in reality - as these 16 economists say - they will crowd out the business investment we actually need for sustainable prosperity. This letter is of course a deliberate echo of that famous economists round robin sent to the Times in the depths of the 1981 recession. As you will recall, the 1981 letter was signed by 364 economists who between them represented virtually the entire UK economics establishment at the time. They ripped into Thatcher's tough anti-inflation policies, calling for an end to fiscal restraint and the abandonment of monetarism. They reckoned Thatcher was driving the UK economy into a deep and prolonged slump (see this IEA paper for the 1981 letter, its signatories*, and some excellent analysis). Fortunately, Thatcher ignored those 364 economists, and we know the rest: the UK embarked on the most prosperous 25 years in our entire history. But, you may ask, if all those learned economists were wrong in 1981, why would this lot be any righter now? A good question. We really are in uncharted waters, and there is an argument for saying we need to use all our engines, sails, oars, anything, to get us out as quickly as possible. But against that, pretty well everyone now agrees lower interest rates would help, and with Bank Rate still at 4.5%, we've by no means exhausted our firepower there. A serious cut in interest rates should surely be tried before public works projects. Especially since the latter would take months, or more probably, years to get going. Clearly big interest rate cuts are what the markets are expecting, which is why sterling is dropping like a stone. And we should recall that during the thirties, what rescued the UK economy from a US-style depression was not Keynesian spending, but a significant loosening in monetary policy - in particular, the decision to leave the Gold Standard in 1931 which brought a big fall in the value of sterling. So bring on more rate cuts. Yes, there are inflation risks: consumer prices are increasing far too fast for comfort. But the price indices are a rearview mirror. And there are few signs that prices are spilling over into wage increases - on the contrary, some private sector workers are even voting for pay cuts (although most certainly not in the tax-funded public sector). Now, I have to say as a retired saver with a monetarist bent, I am very nervous about cutting interest rates, especially as year-on-year monetary growth remains quite buoyant. But given where we are now, and given the alternatives, the fact is there are no riskless options. Beyond that, tax cuts must be the way to go. They could be implemented pretty well immediately, putting money directly into empty pockets, and allowing us to decide how it should be spent. Yes, there's always the argument that tax cuts in a downturn might get saved rather than spent. But, apart from the fact there's very little hard evidence that happens, the cuts could be directed in ways that are likely to give us the biggest bang in terms of supporting GDP - cuts in business taxes spring to mind, and Sam Brittan has suggested a cut in VAT, which would not only support consumer spending, but would also help whack inflation. Let's hope the government and a particularly important signatory* to that 1981 letter read the S Telegraph letters page. *Footnote - the signatories to the 1981 letter included some names we are very familiar with on BOM: Mervyn King, Nicholas Stern, Peston's Dad, and even the Prof himself, Willem Buiter. Just goes to show. One of our very first posts was on Davos, the annual bunfight where Wall Street superstars and Russian oligarchs buy our enthralled rulers. The World Economic Forum was originally set up to debate Big Issues facing the global economy, but it long ago turned into a celeb hobnobbing opportunity where Bondian baddies corrupt the world's venal politicos. "The partying crept in. We let it get out of control, and attention was taken away from the speed and complexity of how the world's challenges built up. We catered to what the financial leaders wanted: solo speaking slots, luxury hotels and VIP treatment we wouldn't afford anyone else. We gave them a soapbox. It was all political. We try to minimize the politics, but can't." 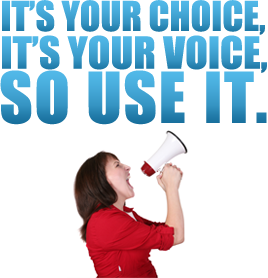 Value to voting taxpayers? Minus several trillion dollars. (And here's a particularly teeth grinding account of that revolting corruption in the Greek sunshine). "A GCSE examination taken by thousands of students was deliberately dumbed down to make it easier to pass, examiners have admitted. The Assessment and Qualifications Alliance - Britain's biggest exam board - said it lowered grade boundaries in science tests to make papers less demanding than previous years. In an extraordinary admission, officials insisted they had been forced into the move "under pressure" from the Government's exam regulator. According to the Times Educational Supplement, they failed to come to an agreement over the mark needed to get a C - officially a good pass - in science. One of AQA's rival exam boards awarded C grades in one paper to pupils getting just 20 per cent of questions correct. On August 7 - just two weeks before results were published - Ofqual wrote to the AQA ordering them to reduce its own grade boundaries to "bring it into line" with other boards." (Telegraph). We all know exams have got much easier - eg see this blog on how A Levels are two whole grades easier. But this is the first time we've found a smoking gun. David Blackie has blogged the lastest outrage from £0.5bn pa quango the British Council. Last year the BC attempted to justify its cost by arguing that "education exports" were worth a staggering £28bn pa, far outstripping other industries like automotive and even financial services. But of course it was complete twaddle, as David describes in detail. In reality, overseas student numbers are way below the BC's ludicrous projections, and are now set to slump in the recession. George, take another note: scrap the British Council and save another £0.5bn. If you're still there, that is. We stopped doing our weekly Recent Bonfires round-up because it got too depressing (see complete back catalogue here). 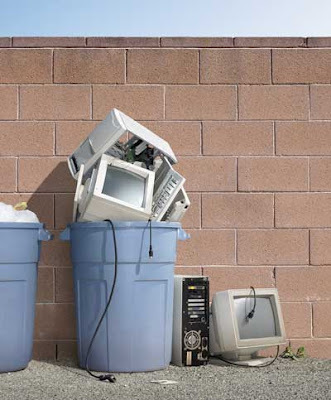 But the good news is that the Sunday Telegraph now does a Weekly Waste Watch, rounding up some of the more egregious example of government waste. Their latest brings news of Labour-run Leicester City Council spending "£7,000 sending its leader, chief executive and two other councillors on a 10,700-mile round trip to Nicaragua and Guatemala to advise local projects about renewable energy", £3m spent by Poole and Bournemouth councils on consultants for local schools, and £10 grand spent by Edinburgh Council "on a consultants' report into relocating a war memorial to make way for a new tram scheme, only to abandon the plans amid an outcry". Keep up the good work S Telegraph. 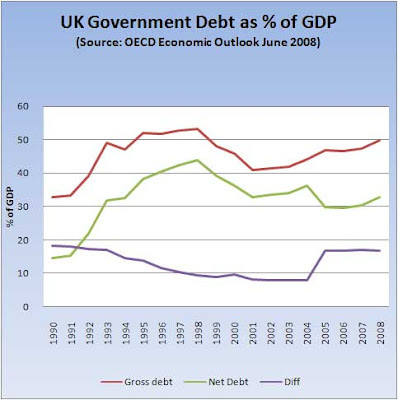 As we've blogged already, having crashed through their own Solomon Binding 40% debt ceiling, the government is now grasping at some OECD debt statistics which seem to show them in a more favourable light. My Lord Adonis did precisely that on this week's Any Questions, lecturing us that the OECD figures for net government debt not only show it's been cut under Labour, but it's now far below many other countries such as Japan. The implication is that Brown's 40% limit was super SUPER cautious, so we shouldn't worry about having to go above it in these unprecedented times. What's the truth? 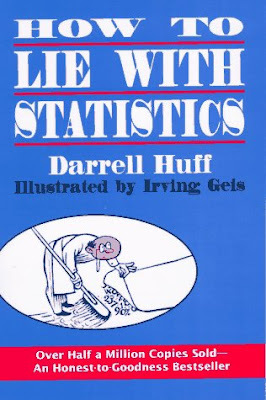 As always, we need to steel ourselves to examine the statistical entrails. Start with the OECD stats. 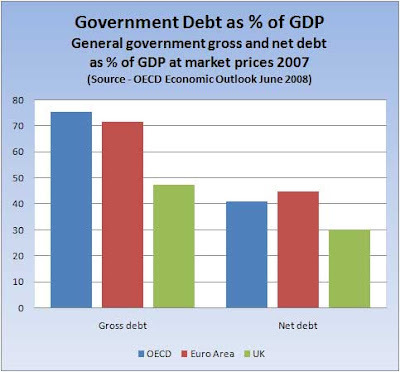 They publish two series for government debt as a percentage of GDP - gross debt, and net debt after taking account of the government's financial assets. A couple of points to note. First, it's true that since 1997 both gross and net debt have fallen relative to GDP. But as we blogged here, the OECD has not yet updated its numbers for any of the bank take-overs, or the latest recession borrowing surge. The OECD's updates to be published in December are likely to hike the 2008 figures significantly. Second, although lower than 1997, both gross and net borrowing are hugely above the levels we had going into the last recession in 1991. And that despite the longest economic boom since records began. Again, on the face of it, the government is right: on both the gross and net measures, the UK looks a lot less heavily borrowed than the rest of the developed world. ... Net debt measures are not always comparable across countries due to different definitions or treatment of debt (and asset) components." (and see detailed methodological notes here). In particular, some countries include part or all of their public sector pension liabilities as debt, whereas the UK government notoriously does not. Their inclusion alone would increase the UK's debt/GDP ratio by 70-80 percentage points, taking us to around 120% on the gross debt measure and over 100% on the net debt measure. And that's even before taking account of £100bn + of PFI liabilities (again, not counted in the official debt stats). There are other major differences too, like what counts as an asset to net off against gross liabilities to give net liabilities. For example, the UK figures net off our gold and foreign exchange reserves, whereas others don't seem to. As we can see, between 2004 and 2005, the difference - ie our netted off assets - suddenly jumped from around 8% of GDP up to 17%, a virtual doubling. Why? We have no idea (the detailed stats underlying the OECD tables are not available without an OECD sub, which Tyler is most certainly not going to pay for). But judging from the size of the jump, our guess is that it is the £100bn + chunk of local authority assets which the ONS opaquely labels "Other UK equity" (ONS data series HN69 - FinStats Table 12.1M). But what are the underlying assets? And since they don't appear to be traded equity, how are they valued? Are they in reality "investments" in pretty unsaleable stuff like social housing? We will investigate further, but we are highly suspicious. How convenient it was for the UK government to suddenly find an extra £100bn of "assets" just at a time when its debt was taking off. 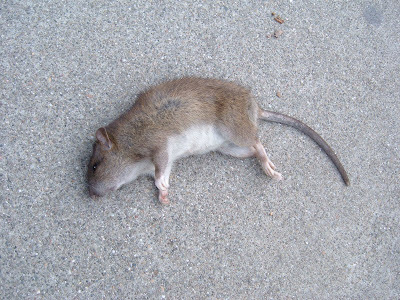 And we wonder what other fat smelly rats are scurrying around under the debt floorboards. The issue of public debt is now centre stage. There is no doubt that Big Government Brown is set to indulge in all kinds of "Keynesian" fantasy projects, and our debt is set to soar. But at least let's keep our eyes open. Don't let's get fooled into thinking more debt will be relatively painless because we've got so much less than other people. We haven't. After his far too lengthy hols, the Doc has finally returned to the blogosphere. "I have been “round the houses” so many times on so many issues that I lose the will to live. Hence the prolonged blogging break." As we've told him many times, his country needs him. The rest of us can wave our arms about the problems of the NHS from the outside, but we lack his insider's insight into what's really going on. We've sorely missed his robust ability to cut through the crap, and his provocative style. "Junior doctors are not getting the experience they need. Real nursing care has disappeared. Elderly patients are dying of malnutrition or hospital acquired infections because there is no one to feed and clean them. Paramedics are pressurised into not taking critically ill patients into hospital. GPs are to be “incentivised” to keep sick patients at home. The de-skilling and dumbing-down gathers momentum. It is, I suspect, already unstoppable. The protocol-driven target culture “empowers” (as the government would say) unskilled workers to appear to do jobs which are in reality beyond their competence. And so it goes on. Meanwhile, the boxes continue to be ticked, the targets are hit, and so all is well in the world of healthcare." PS Mrs T and I read Doc's post on the new drug for MS sufferers with a sense of inevitable disappointment. As we may have said before, a member of the Tyler family has MS, and so news reports this week of a new miracle drug got our full attention. But was it too good to be true? Sadly, yes, and the Doc gives us some chapter and verse on why. It's the sort of thing the msm ought to do, instead of constantly raising false hopes in pursuit of a good headline. But I guess nobody ever promised decent and truthful. This morning's GDP figures make grim reading: as expected, the Brown boom has finally ended in bust, with a chunky 0.5% GDP fall in Q3. It's a good moment to look back on the Brown boom and ask what drove it? Over the whole period from 1997 Q2, GDP has grown by 35%, or 2.7% pa. Over the comparable 11 year period up to 1997 Q2, GDP grew by 32%, or 2.5% pa. So on the face of it, Brown's boom was bigger. Except that, as we've blogged many times (eg here), Labour permitted an unprecedented immigration surge which increased our population by 3-4%. Adjusting for that means GDP per head (which is what matters) has grown by about the same under Labour as it did during the previous 11 years. But when we look at the composition of growth we find a significant difference. Because under Labour, getting on for two-thirds of Britain's growth has come from Business and Financial Services. Those industries grew by an astonishing 5% pa, without which our overall growth rate would have been well under 1.5% pa*. In terms of our economic output, this was a one-legged boom. 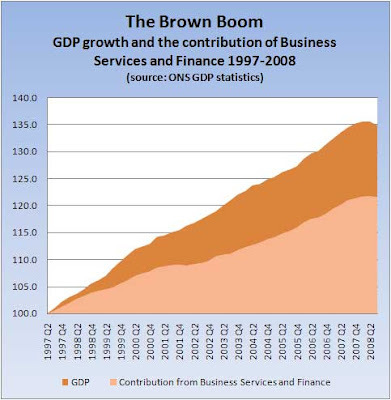 Of course, under the Tories, Business and Financial Services also grew strongly, but by a much more modest 3.2% pa, accounting for 40% of overall growth. And note that 11 year period (1986 to 1997) encompassed the now demonised Big Bang. So what precisely are these industries, which together comprise nearly one-third of the economy? The good news is that it's much more than just those imploding banks and brokers. The bad news is that much of the rest - like legal services, accountancy, IT services, and real estate services - is heavily dependent on financial services and burgeoning debt. It is highly unlikely that the pain in financial services will not spill over, dragging them all down. The reality is that Brown's boom was built on a group of industries that are now facing an Almighty bust. *Footnote - Yes, I know there are some tricky technical issues in measuring the output of financial services. But all figures quoted here are the ONS's official GDP stats - they are our best estimate, produced by Britain's top statistical brains. It would be amazing if the big picture was wrong. Production of platform boots is booming! On Monday we blogged yet more evidence that the government's serious crime stats are useless. Just three days later, we get even more evidence. It turns out the police recorded crime stats have been hugely under-recording serious violent crime for a decade. In consequence, the total for murder, attempted murder, manslaughter and severe assaults has suddenly leaped by 22%. Naturally the commissars blame dim coppers for not following the State Statistical Bureau's detailed 15,000 page data manufacturing manual to the letter. But as we've said many times, when you ask people to fill in their own high stakes tractor production scorecards, you're bound to get gaming problems like this. Which is one very good reason for disbelieving the official stats. ...The real disaster with this is that it will increase people's distrust of the data and millions will go on believing they are at increased risk of violence." Translation: we don't need facts to support our view that serious violent crime is coming down; if only you silly little people out there would listen to us, instead of demanding "proof", your lives would be so much better. If you can be bothered to read the latest tractor stats, they're here. Evenin' all... did I ever tell you about my bad back? "Police forces lost more than one million days to long-term sick leave last year at a record cost of nearly £90 million... The cost has soared by more than 20 per cent in the past five years despite a drive within the police to reduce prolonged sick absences... stress, depression, back pain and other musculo-skeletal disorders are mainly responsible." "The model of running the nation’s policing off a spreadsheet in Whitehall is failing the police and the public. Central mismanagement has produced a system so tangled with red tape and targets that good officers are being driven into illness." The really shocking point is that when it comes to sickies, the police are among the best of the public sector workforces. They take an average of 8.3 days pa, whereas across the whole public sector the average is 9.8 days pa.
And some bits are much worse. When last sighted, average sick leave in the NHS was running at two and a half weeks pa (12 days pa), and in some HMRC offices it averages nearly five weeks pa.
For comparison, sick leave in the private sector averages 7.2 days pa.
As we've blogged many times, you can't entirely blame backsliding lead-swinging public sector workers. The fundamental cause is poor management. In Tyler's experience, few managers ever enjoy confronting poor performers, be they in the public or private sectors. But in the public sector, managers know they can expect no support from the top. This government has actively undermined its managers through half-baked programmes to root out supposed discrimination and bullying. Tackling underperformance hasn't had a look in. Taxpayers are reaping what the government has sown. PS And let's not forget the Tory MP who worked in the City while on a sickie from the Commons. 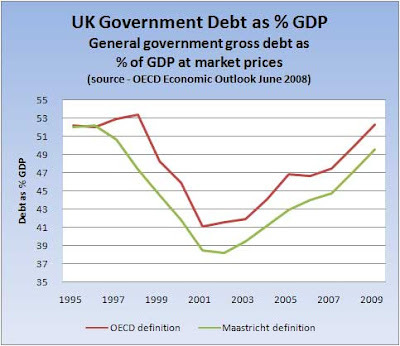 As we keep moaning, bank bail-outs and the worst recession in our lifetimes mean that government debt is set to soar. Well so what, says Gordo - as Mr Keynes pointed out long ago, in circumstances like this responsible governments must borrow us out of recession. We can pay it all back eventually, and even if we can't, in the long-run we're all dead*. Anyway our grandchildren can sort it out - they'll be delighted to help us. Except of course, public debt chickens have a nasty habit of coming home to roost long before we're all safely tucked up downstairs. There's the grim business of debt servicing - interest payments to you and me. Whether you're an individual or a government, it's a sad fact that the more you borrow, the more interest you have to pay. And as your debts mount, you find yourself paying an increasing proportion of your income just to meet interest payments. Which leaves a lot less for spending on other things, be they new cars, or schools and hospitals. The chart above shows how this "income gearing" worked for successive UK governments over the last 60 years. The key point that jumps out is that right up until the late 80s, governments of all complexions routinely spent 10-13% of their income (ie our taxes) on debt interest. It was only in the late 80s that the interest burden started falling significantly, eventually reaching 5-6% in the early years of this decade. And understand this - the 4 percentage point fall in the burden of debt servicing during NuLabour's first term was absolutely crucial in allowing them to increase spending on other things. In today's money it was a free gift of around £20bn pa (or 6 pence on the standard rate of income tax). And it provided fiscal firepower to later boost spending on schools and hospitals without apparently undermining the budget. Unfortunately, this entire process is now set to reverse, switching from a virtuous to a vicious circle. Indeed, the chart shows the burden has already increased from the lows. So let's take a closer look at the history and see if we can pick out some lessons for good government. Britain emerged from WW2 with crippling public debt: the official National Debt stood at 250% of GDP. Attlee's government attempted to keep down servicing costs via a so-called "cheap money" policy - keeping interest rates very low, generally below 1%. But with big debts, even that wasn't enough to get the interest burden below around 12% of government income. So the first lesson is don't, whatever you do, rack up big debts. Later, as our economy grew through the having-it-so-good 50s and early 60s, our National Debt shrank to around 100% of GDP by 1963. But the servicing burden remained stubbornly stuck at around 12% of government income. That was because the interest rate on government debt (gilt yields) had more than doubled during the 50s. Why? Because inflation had begun to take off, and government bond investors were demanding higher yields in order to compensate for the inflationary erosion of their bonds. As the 60s gave way to the hyper-inflationary 70s, gilt yields moved even higher, reaching 17%+ in the dark days of 1974. 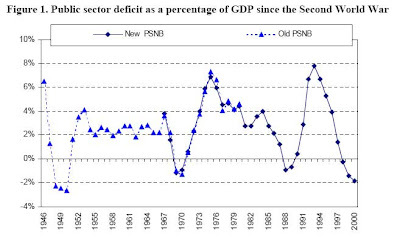 The debt servicing burden - which had fallen a bit as a result of emergency budget cuts in the late 60s - soared right back up above 12%. So the second lesson is don't, whatever you do, rack up inflation. It was only under Thatcher that government finally got a grip. 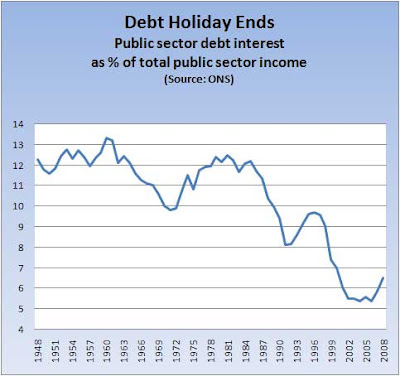 Robust public spending restraint (eg see this blog), combined with tough(ish) monetary policy finally got both debt and inflation heading down. And taxpayers reaped a huge benefit in terms of the debt servicing burden, a benefit exploited to the full by NuLab. So the third lesson is do make absolutely sure you keep a tight grip on public spending and monetary policy. And against these lessons, how is Gordo stacking up? With a Keynesian splurge, an abandoned inflation target, and a hey nonny no, I fear the answer is only too clear. Some day, when I'm awfully low, I really am going to set up that debt doomsday spreadsheet we talked about. *Footnote - Of course it was Keynes who said that in the long-run we're all dead, but it was a practising Keynesian - to wit, Adolf Hitler - who came up with the best line on funding huge public works projects with debt. He reportedly told his economics minister, Schact, "If we win, the debt won't matter, and if we lose, the debt won't matter". Gordo has doubtless whispered something similar to Prudence. PS At least battlefield humour is still going strong - here's a dispatch from an unflappable City fund manager of Tyler's acquaintance. It says: "We seem to have avoided any major blow ups here so far, but the sound of ticking is never far away. Still I think some of the competition can only be identified by their dental records." Keep smiling. 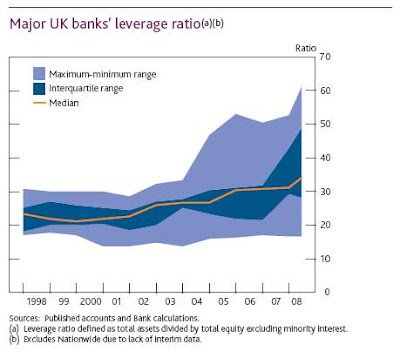 Bailing out the banks has exposed UK taxpayers to huge potential losses. Nobody has any idea how much, but history maybe gives us a sighting shot. "Fiscal costs, net of recoveries, associated with crisis management can be substantial, averaging about 13.3 percent of GDP on average, and can be as high as 55.1 percent of GDP. Recoveries of fiscal outlays vary widely as well, with the average recovery rate reaching 18 percent of gross fiscal costs." So if we experience the average loss, we're in the can for about £200bn. Which is £8,000 for every single household. Of course, the loss might be less than the average. In resolving the Nordic banking crisis of the early 90s, Swedish and Norwegian taxpayers got away with a net cost of about 3% of GDP. But on the other hand, the loss might easily be much greater. Resolving the Japanese banking crisis eventually cost Japanese taxpayers an estimated 24% of GDP. On that basis, we'd lose £350bn, or £14,000 per household. "Output losses (measured as deviations from trend GDP) of systemic banking crises can be large, averaging about 20 percent of GDP on average during the first four years of the crisis, and ranging from a low of 0 percent to a high of 98 percent of GDP." 20% of GDP would be around £300bn, or £12,000 per household. True, Japan got away with a bit less than that, but Sweden lost nearly 30%. So should we have left the banks to fend for themselves? "There appears to be a negative correlation between output losses and fiscal costs, suggesting that the cost of a crisis is paid either through fiscal costs or larger output losses. Furthermore, if this correlation is proven robust, it suggests that even in the absence of significant government intervention, fiscal losses may be large due to tax revenues forgone because of higher output losses." And the IMF averages suggest another scary debt stat to add to our last blog: if the straight fiscal cost of the bail-out is 13.3% of GDP, and GDP itself is 5% lower (= total 20% loss spread over 4 years), then, all else equal, our 2012-13 official debt-GDP ratio reaches 66%. Add in the fiscal impact of the lower GDP, and the ratio gets to 80%. And that's before a whole stack of other knock-ons, like crazy public works projects. Unfortunately, even George's Russian billionaire can't get us out of this one. According to the government, because they cut borrowing so much from the level they inherited from the Tories, they have loads of scope to borrow more now. 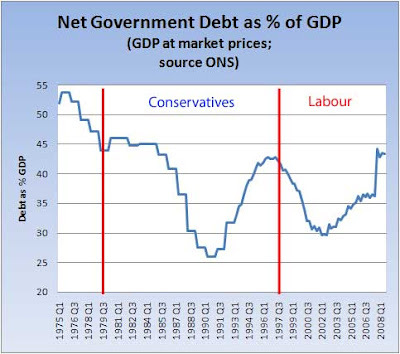 Others point to the leaky roof, and the fact that borrowing is higher now than when Labour came to power. In theory, it should be easy to see. But in practice, government debt statisticians produce such a vast array of numbers that the truth gets overwhelmed - as the current debate shows only too well. Let's go back to the basic stats. The official ONS stats released yesterday say net public debt as at end-September was £645.3bn, equivalent to 43.4% of GDP. In Q2 1997, that percentage stood at 42.9%. So under the official definition, Labour has unambiguously increased public borrowing since it came to office (see yesterday's blog). This official definition of debt was the creation of Mssrs Brown and Balls when they set up their fiscal rules a decade ago (including the rule that said this measure of debt should never rise above 40% of GDP). But now that the fiscal house is in flames - or underwater, or in negative equity, or whatever is today's image - Brown is pointing to alternative debt measures. He claims on them we're doing much better, especially relative to other countries. At first glance, you might say Brown's right. On both of these international measures, we're still below (just) the level of indebtedness he inherited (as previous commenters on BOM have argued). So maybe things aren't so bad. But what Brown doesn't mention is that neither of these two international debt measures has been updated to include Northern Rock. Doing that adds 5-6 percentage points of GDP, taking both measures uncomfortably above the level he inherited. And that's before taking account of Bradford and Bingley, and the £37bn of bank shares he's just bought. Then there's the virtual nationalisation of RBS, which if counted in the public sector would add an eye-watering 120% of GDP to our national debt. As for our position relative to other countries, it is true that some other major countries do have higher debt to GDP ratios. But as the IFS points out, that was a position Labour inherited, and under their stwardship we have actually been climbing the OECD's indebtedness league table - from 10th to 8th place. And of course, looming behind all of these recorded debt numbers is that huge dollop of taxpayer debt that successive governments have kept entirely off balance-sheet: £1 trillion or so of unfunded public sector pensions, PFI debt, nuclear decommissioning costs, and sundry other guarantees and IOUs scattered around the ex-nationalised industries (eg see this blog). PS In case you missed it, yesterday's Newsnight featured ex-Paymaster General G Robinson (one of the original Three "Wise" Men) telling the nation that even adding in all the PFI liabilities would only increase our net indebtedness by 1% (watch again here - 23.25 mins in - HTP CL). The reality is that PFI debt now totals c £100bn (see this blog), which increases our net indebtedness by c 15%. Liar or idiot? Actually neither. Those pesky debt statisticians at the ONS have so far only counted PFI liabilities that are in the form of so-called finance leases, and they do indeed come to around 1% of government debt. But while that may be technically defensible, when private companies do the same thing, people like credit rating agencies look straight through it. What matters is the underlying economic liability from PFI, and to all practical intents and purposes, that rests entirely with taxpayers. This month's credit card bill has just crashed onto the doormat. In fact it's so big and heavy it crashed straight through the floor. The outstanding balance of £645bn is the biggest ever. And net borrowing of £37.6bn year-to-date is the highest since modern records began in 1946. Truly shocking. Worse, this takes no account of the downward economic lurch now in prospect, let alone all those Keynesian splurges everyone's now talking about. In technical fiscal parlance, we are totally, hog-whimperly, stuffed. Of course, government ministers are scuttling round saying it's not a problem because they've cut our debt so much since 1997 - Lord Mandy repeated the formula yesterday. But that's not at all what the official ONS statistics say. 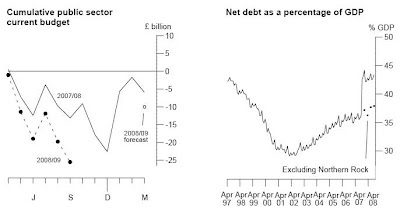 When Labour came to power in 1997 Q2, net debt stood at 42.9% of GDP - lower than today's 43.4%. So they haven't cut our debt at all. Well OK. During the longest boom this country had seen since 1379 (as Gordo kept bragging), they did manage to get borrowing down. The low point was 29.7% of GDP in 2002 Q1. But that was reached only after 8 years of 3% pa growth, and compared poorly with the 26% achieved by the Tories just before the early 90s recession. The truth is they chose to ignore the possibility - no, the certainty - that one day we'd hit another recession and would need to crank up borrowing to get us through. According to the government, crime is falling. According to the evidence of our own eyes, it isn't. One of us must be wrong. The government's line - enthusiastically supported by the Prog Con - is that people who deny the fall in crime are rabid right wingers wilfully ignoring the evidence. Mark Easton, David Aaronwitz and Danny Fink all assured us of that after the latest official stats were released during the summer (see previous blogs here, here, here, and here). As we've blogged many times (eg here), we do accept that some crime has almost certainly come down. Property crime - burglary and car theft - has fallen as anti-theft technology has improved and the market price of nicked DVD players has slumped. But we wonder how that will fare in the recession, and anyway that's not the crime most of us really worry about (and btw its fall is no thanks to the government). When it comes to violent crime - crimes against the person - the crimes we really do worry about - we simply don't accept the government's account. We don't accept the crime stats. We think the police recorded stats are now routinely gamed and distorted just like any other tractor production numbers. 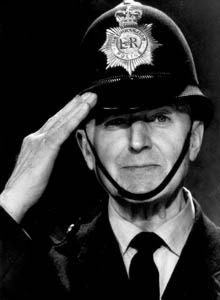 And we think the British Crime Survey is nothing more than an opinion poll commissioned by people (ie the Home Office) who have A Very Big And Very Obvious Axe (see blogs here and here). So how big are the distortions? "The number of firearms incidents dealt with by officers annually is 60 per cent higher than figures stated by the Home Office. Last year 5,600 firearms offences were excluded from the official figures. It means that, whereas the Home Office said there were only 9,800 offences in 2007/8, the real total was around 15,400. The latest quarterly figures, due to be released on Thursday, will again exclude a significant number of incidents." "Knife crime figures were at least two-thirds higher than official figures. Police statistics showed forces in England and Wales are on course to record 38,000 serious knife crimes this year, or more than 100 a day, compared with last year's official total of 22,151 offences, a figure announced by the Home Office in July in its first annual count of knife crimes." So the government's official crime figures understate police recorded gun crime by 60%, and knife crime by two-thirds. Remember that next time the Prog Con asserts the crime stats are correct. They're not. PS What would we do? First, as we've said before, the Home Office should not be marking its own scorecard - all national crime stats should be transferred to the ONS soonest. Second, our elected local sheriffs would reconnect policing with local communities, where disembodied official stats would cut much less ice than the actual experience of people on the streets. "A project that has cost £500 million has spent £25,000 on a party to celebrate a milestone in the project. It has spent over £9,000 on commissioning artworks (paintings and photographs) many of which gather dust in its warehouse in Canning Town, along with over £150,000 of 'overprinting' of promotional documents (plans and proposals)." 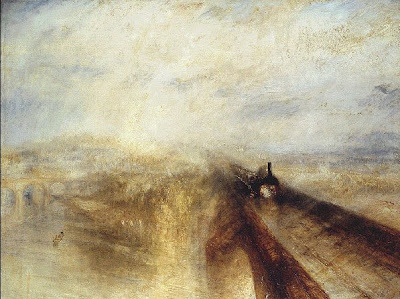 Crossrail's PR chief (oh yes, they've got one of them all right) boasts about how their artists will vie with famous railway painters Turner, Pissaro, and Frith. Somehow he forgot to mention none of them were employed by tax-funded railway companies. "Taxpayers may have to fund the full cost of the £1billion Olympic village as the credit crunch scares off private investors for the 2012 Games, Olympic chiefs have admitted. The private sector was originally expected to fund the full £1 billion for the village but the Government has already pledged £550million with Lendlease trying to secure the remaining £450million from private banks with little success. We've blogged the Olympic Village funding fiasco before (eg here). The organisers blithely assumed the private sector would be happy to stump up the £1bn cost, on the grounds that they'd own the village and property prices are a one-way bet. Everybody knows that, don't they? Naivety doesn't quite capture it. Either way, we taxpayers are now paying the price. And Armitt's phrase "very largely in line with budget" should send a serious chill down our spines. "The £30bn (€38bn) Universities Superannuation Scheme will invest $3bn (€2.2bn) in hedge funds. The decision comes despite several high-profile hedge funds reporting substantial falls so far this year and hedge fund indices recording double-digit negative returns. Riiiiiiiight. Would that be Great Opportunity as in that great opportunity to step aboard the Titanic just as its bow dipped temporarily beneath the icy waters? And who guarantees all those university pensions? "Many state benefits, such as Child Benefit, Incapacity Benefit and Disability Living Allowance, are usually uprated in line with the 12-month rate in September of the all items Retail Prices Index (RPI). In 2008, the September rate was 5.0 per cent, compared with 3.9 per cent in September 2007. The September RPI is also used in the formula governing the basic state pension, which was set out in the 2007 Budget Report and repeated in 2008. This states that increases in the basic state pension will be in line with the Retail Prices Index or 2.5 per cent (whichever is higher). Income-related benefits (for example, Job Seeker's Allowance, Housing Benefit and Income Support) are usually uprated in line with September's 12-month rate of the Rossi index, defined as the all items Retail Prices Index excluding rent, mortgage interest payments, council tax and depreciation costs. In the months to September 2008, the Rossi index increased by 6.3 per cent, compared with 2.3 per cent in September 2007." Or as NL puts it, that's 6.3% for the chavs then. And since average earnings are now growing by only 3.4% pa, work will be paying considerably less well than benefits this winter. A Tory posts a good letter making visible the strength of HSBC. HSBC are widely thought to be standing ready to take over any other High Street bank casualties - but only on the firm insistence that existing shareholders are totally wiped out. Pity they're not representing taxpayers in place of our wibbly deal makers... er, deal takers. As BOM readers may recall, last year the Major and Tyler established a campaign against Nanny's plan to stop the responsible folk of Guildford enjoying the odd noggin or two. They objected most strongly to Nanny's outrageous statistical fiddling aimed at proving Guildfordians are dangerous social miscreants who spend all day pickled in Albanian claret. They railed against the threat of even higher booze taxes, and fresh restrictions on responsible drinkers. Well, they are not alone. All over the country, drinkers are similarly incensed. And now they're coming together under a new campaigning banner - the Drinkers' Alliance. Their excellent website is here, and they are promising to run a highly active campaign. Last week they launched some great ads (appearing on selected blogs - including BOM) pointing out that while our Westminster politicos want to tax us to abstention, in the confines of their own Palace they themselves knock back prodigious quantities of booze subsidised by us effin' taxpayers. The Major and Tyler have already signed up, and may we urge you all to do the same (here). Nanny needs reminding how the master-servant relationship works. The £70m pa quango the Healthcare Commission has just published its Annual Healthcheck, a massive analysis of every health trust in the country. It supposedly tells us how our local NHS hospitals and GPs are doing. "For the second consecutive year, annual improvement is evident. In particular, we have again seen roughly a 10 percentage point increase in the proportion of trusts scoring excellent for quality of services." 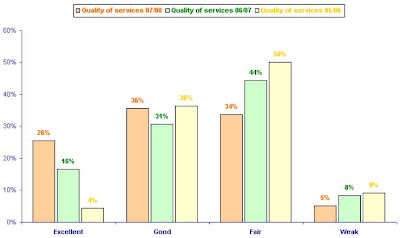 In 2007-08, no fewer than 100 NHS trusts achieved Excellence - 26% of the total. Now, as regular BOM readers may recall, the Tylers had direct experience of a "flagship" NHS hospital trust during the year in question: Mrs T's 92 year old father was a patient for many weeks before his eventual death just before last Christmas. It's fair to say we were not impressed: disorganisation, with the left hand never quite knowing what the right hand was doing; nursing staff who seemed more concerned with paperwork and "handovers" than ensuring patients were eating and drinking enough (with the result that seriously dehydrated patients were constantly needing a drip); lack of privacy (including mixed wards); poor cleaning (eg sticky floors on the ward); and generally downbeat demoralised staff kept going only by vast intakes of canteen fat and sugar (see previous blogs eg here and here). It was both worrying and depressing. So how does such a hospital score on the Healthcare Commission's ratings? Presumably it would have to be Weak. Or Fair, at best. The Oxford Radcliffe Hospitals NHS Trust is rated Excellent. Say goodbye to the City as the engine of UK growth. The head of the FSA has just formally announced the start of hard-line regulation, large swathes of our banking industry are now under Whitehall direction, and politicos of all parties are falling over themselves to announce further plans and controls. There will be big consequences as bankers leave for more accommodating homes elsewhere (and see this blog). Hedge funds are already rushing for the exit. Because of the UK's archaic bankruptcy laws, $65bn of their assets held by the London end of busted Lehman have been frozen by the administrators, with no date for their release. Hedge funds and their clients are very angry: they're switching billions in so-called prime brokerage accounts - a highly profitable business - from London to New York (HTP JW). Now in all the circs, you're probably saying good riddance. The bill we taxpayers are now facing to clear up the high-rolling City's mess is outrageous. And the economic chasm that's opened beneath our feet has surely been caused by the City's greed and wild risk-taking. Risk is a fascinating subject. Risk is something few of us ever want to take, but which is absolutely vital to our prosperity. Unless we're prepared to take risk, our cash lies stuffed under the mattress and economic growth becomes a thing of the past. Because growth depends on investment, and investment depends on risk-taking. Let's take a look at how we as individuals choose to hold our wealth. 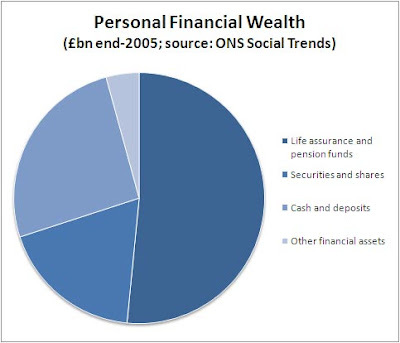 According to the Office for National Statistics, as at end-2005 our personal wealth totalled £7.6 trillion (about six times annual GDP). But over half of that was held directly in the form of property and other physical assets - assets we can see and touch every day, and which we use for our own benefit. That's wealth all right, but it's generally not productive investment in the sense of money we've risked on business ventures which will grow the economy. 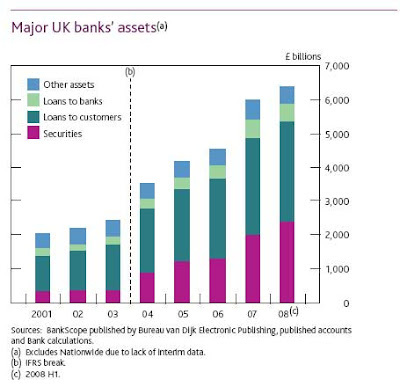 As we can see, a quarter of our financial assets were held in cash and bank deposits - ie they were stuffed under the mattress. These are savings that we assume to be absolutely safe. They are savings on which we accept low returns because we don't want to take any risk at all. Which is why we get so upset when banks start wobbling, and why no sane government can allow its banks to default on retail deposits. Over half our financial assets are held in pensions and life assurance policies, which are especially interesting. Because as any insurance salesmen will tell you, these products are sold, not bought. In other words, we mostly hold them not because we decided to do so, but because we somehow got talked into them. Sometimes that's because of a high pressure pitch from one of those salesmen, but more usually we just stumble into them via our employment (pensions), or via some other transaction like house purchase (eg those famous endowment mortgages). Why's that important? Because it means most of us have absolutely no idea how risky such assets can be - right up to the moment they explode in our faces. That's the first time we find out that all the reassuring sounding pension promises and finely tooled endowment policies are actually no more than a "best endeavours" indication. We've been holding risky assets all right, but we never knew they were risky. And when it comes to obviously risky stocks and shares, overall we hold less than 20% of our financial assets in that form - and most of us don't hold any. So we make it absolutely clear in our savings behaviour that we don't like risk. Which is a problem. Because as we've said, without someone taking risk, we don't invest. And if we don't invest, we don't grow. We are now living with the Naked City. The City is stripped bare. Any mystique it once had about sophisticated risk control, about delivering rocket fuelled returns without hideous risks, has been blown to smithereens. Investors have taken fright, hedge funds are in the process of imploding, and everyone realises there really are no free lunches. Heavy regulation is on the way. There will be stacks more monitoring and control. Confidence tricks are out, and transparency is the new order. In truth, both defined benefit pensions and with-profits life assurance depended on a confidence trick. Savers believed they were pretty well riskless, when in fact they depended on the uncertain performance of financial markets. But because they were very long-term contracts, in almost all circumstances they turned out fine. They were a way of allowing us wimpy risky averse punters to invest for the long-term without worrying about the risks. And their loss is a loss to all of us. In finance, revealing all for public inspection has a nasty habit of costing us dear. Could We Settle For A Lost Decade?